Weddings are wonderful. It is your chance to put all your creative skills to the test. You have to work with colour – sometimes very bizarre colours! – A variety of arrangements and sometimes in several locations. You also have to cope with a nervous bride-to-be sometimes an interfering mother and the worry whether everything will turn out alright on the day! But despite all the hard work and headaches every florist enjoys them. Therefore, bridal bouquets need to be planned well in advance. The bride-to-be may well have an idea of what she wants and you need to take into consideration the colour scheme and style of the wedding and also the style of the wedding dress. For example modern bouquet of cala lilies wouldn’t look right with a full dress, likewise a shower bouquet would look all wrong with a simple sheath gown. So always bear that in mind. This design is formal and very popular with traditional weddings. The overall size of the bouquet is usually a third of the bride’s height but obviously can be bigger or smaller depending on the type of dress worn and the height of the bride. The effect should be a graduated cascade of material with larger or stronger coloured flowers in the centre and trailing foliage. There are two ways to create this type of bouquet - it can be both natural and wired or placed in a foam holder which can be bought from any floral wholesalers. Obviously using a foam holder is less time consuming than wiring every single head for a bouquet but wiring does allow you to adjust the design and gives it more movement. Either way the design principle is the same, so if you’d rather use a foam holder, follow the steps below but do not wire the stems, simply cut them to size and place them in the foam. Five tulips; four stems of freesias; bunch of spray carnations; soft ruscus and other foliage; ribbon; wires and tapes. 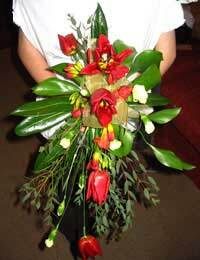 Begin grouping the freesias and carnations in flowing lines throughout the bouquet. Make any final adjustments to design. This type of bouquet can be made using so many combinations of flowers and foliage and well as a variety of colour types. The important thing is not to put too much material in it otherwise it could end up losing its shape and design. Sometimes it is nice to just use one type of flower such as a lily with plenty of big leaves and trailing foliage or perhaps some full blown roses and buds with ivy and hypericum.